Nashville is not only Tennessee’s capital city, it is also world-renowned for its music. The story began in the late 1700s with Settlers who enjoyed fiddling, and has continued and expanded since then. Nashville is also known as a songwriting capital with many aspiring musicians. Specifically, music enthusiasts will enjoy themselves as they experience this city and its many venues and sites while experiencing the atmosphere the music scene exudes. Before you expose yourself to the contemporary musical atmosphere, I suggest you dive into historyfirst to understand why Nashville’s music scene has developed a certain way. The downtown Ryman Auditorium should top your list, as it is the soul of Nashville, featuring a number of exhibits. Moreover, the Grand Ole Opry is a radio show that has run for more than 85 years. Also, don’t miss the “Home of a Thousand Hits”, the Historic RCA Studio B, that gained popularity through Elvis Presley recording there. Head out there and take it all in; expose yourself to the eclectic atmosphere of diverse Nashville. As diverse as the city itself are the options for the right tunes. Head over to 12th and Porter, a famous live music venue which is considered one of the best in the nation. The 5 Spot sits in the east of Nashville and well-known for selling cheap beer while welcoming mainly country and folk singers on stage. If you like to listen to local artists, check out The Stone Fox; they also feature touring bands. For the jazz and blues fans out there, keep Bourbon Street Blues and Boogie Bar in mind. Live music is mostly free. Other free music joints you generally find over in Midtown, for instance. Wandering the city, dancing the night away, and listening to different music genres is tiring. 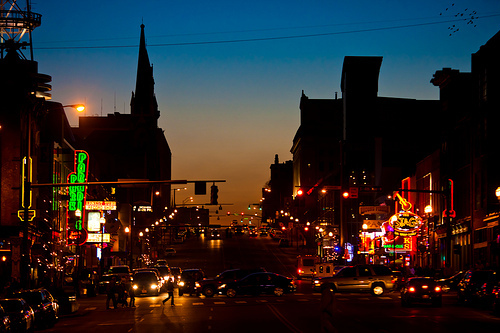 Thus, accommodation for a good night’s sleep is key - and Nashville is home to many charming places to spend the night. The best time to go is between April and October, as this is when the city is in full bloom, music-wise — although it can get very humid in summer. For bargain hunters, winter time is ideal and charming with the beautiful decorations. Look for deals and try finding your perfect place close to the Music Row, where businesses related to the music industry live. You will find a great number of sites telling the unique story of the music city. Make sure to check out the Country Music Hall of Fame as well as Musicians Hall of Fame and Museum. The Music City Walk of Fame is a must and so is the Music Mile. Additionally, walk down the Honky Tonk Highway and expect live music all day long. Go to a songwriters’ night; you might see the next talent on stage. For music of all genres that keeps you dancing until the early morning hours, head over to 2nd Avenue. Lower Broadway is your choice for unique, cheap venues and unbeatable drink specials. This piece was written in collaboration with IHG - InterContinental Hotels Group.